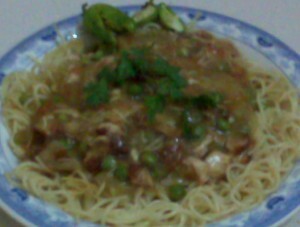 Chicken Chopsy recipe by swtmanoo at DesiRecipes.com. First marinate chicken cubes with salt , pepper, soya sause (1 tbsp) and corn flour (1 tbsp) for two hours. Take a pan and add oil for deep frying then deep fry the boiled noodles until light golden colour (till crunchy). Take another pan and add 2 tbls of oil and heat up then add chicken cubes in it and properly cook until its color changes. Then add all veges in it and also add pepper, salt , veneger, soya sauce and chicken stock and cook well for 4 to 5 minutes. Then add 2 tbsp of cornflour and cook until it thickens. Gravy is ready now. Now take a platter and put the fried noodles in plate at all sides then in the mid put the chicken gravy sauce and garnish with mint leaves and green chillies.